“Rajiv has given us a new pair of spectacles through which to understand and see our own traditions. He has done this with meticulous scholarship. With devastating bluntness he has smashed the distorted lenses which were fabricated by so called scholars abroad and here, and through which to our shame we had been seeing our religions and traditions. So it is a dual contribution he has played. The book is full of facts and documentation. But even more so, it is suffused with very important argumentation. It is not citation mongering, just quotation from here and there or just alleging conspiracy theories. It is an argument that he gives us as to why a certain proposition which you and I have taken innocently is being advanced. Many scholars say things in complicated ways; very often they say it in such a soft way; they are still looking for careers or acclaim in the very circles that need to be exposed. Rajiv told me that his formula and attitude in this matter was that we must be, to use his word, ‘un-ignorable’. It is a wonderful word. But this does not mean abuse or just a torrent of strong words. It means that the kind of scholarship and documentation which he has provided. An important reason why he is an example to us is that he is truly independent. He is not dependent on any institution. He is not dependent for acclaim from an audience. Such true independence of any individual scholar is an example which we should always bear in mind because too often in India I find that too many of us look for institutional purchase from which to do some work. But the great work that has been done by scholars has often been by individual scholar working absolutely alone, unaided and often unrecognized on both sides. So we should take heart and follow the example of a person like him who laboring alone has been able to make a big impact. The book was a particular education for me because I always focused only on the Marxist historians and felt that they were regurgitating or swallowing or vomiting what had been written by some Soviet historians. But I now realize after reading Rajiv’s books that actually they were swallowing and vomiting what many of these so called Western scholars in America, Austria or Germany had written with a purposeful agenda. Rajiv has explained that Hinduism and Buddhism are the closest religions to the spirit and substance of science. Just as the goal of science is the understanding of outer reality, its methods is experimentation and peered review, its means is the laboratory, so also Indic religions are the science of the inner world. Their means is personal direct experience, and their peer review is unending. That is how they keep evolving. This method is the scientific method of empirical verification through direct personal experience. Here a very good phrase Rajiv uses is that our ongoing evolution is through the living laboratory of these sages. They looked inside their own mind and came up with great insights. So time is on our side and we should work on this matter and practice our religion with great confident. If something requires reformulation, we should reformulate and say yes, we have reformulated it because this is the formulation required for this time. If we need to endow old words with new meaning we should do that with confidence. I am sure after reading Rajiv’s book you will have a little contempt for these tendentious scholars. The main thing to do is to succeed. Nothing succeeds like success. Not one of these scholars will fabricate and propagate about China the type of nonsense that he does about India. China has become strong, and these scholars know if they write things about China they will lose their livelihood because they will lose their access to their sources. So the important thing is to succeed and then everything else will follow. One final reason for being confident is that because of the work of Ram Swarup, Sitaram Goel, Koenaard Elt, David Frawley, and Rajiv Malhotra the corpus is now reaching a critical mass. So, that we can think that within few years we will have a library for India and a library of India. 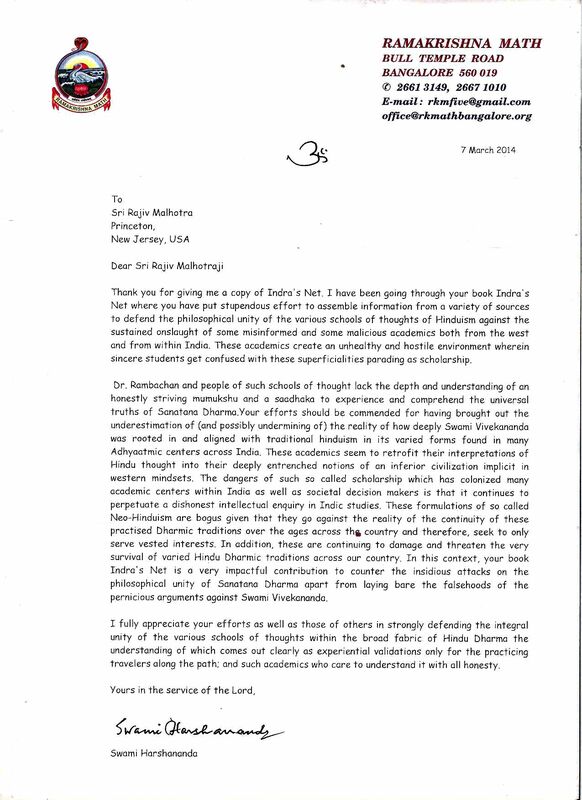 The prerequisite is that we should be like Rajiv Malhotra, we should know our tradition, we should know our religion. The reason on account of which this kind of fabrication has prevailed for so long is that we have not known our tradition, we have not known our religion and we have seen only through the distorted lens which was fabricated by these tendentious scholars, missionaries and muftis. “Hinduism in the 21st century is a global religion like at no other time in its past. To some extent, this phenomenon is itself a consequence of India’s recent history as a British colony and the challenges faced by the adherents of its various Sampradayas. In particular, the ancient tradition of Advaita Vedanta, with its twin legacy of scholastic philosophizing and experiential teaching, has come to the forefront as one that speaks for the broadest spectrum of Hindus. This is in no small measure due to the activity of Swami Vivekananda and those who followed and extended his work. In turn, this poses severe challenges to academic scholarship and its disciplines that are rooted in an intellectual tradition that is rooted in European history. The world of academic scholarship is confronted with a religion that has no one historical founder, yet has a central body of scripture, which has been interpreted and experienced by multiple people through history. It often seems that academia struggles to come to terms with the Hindu phenomenon, both in India and abroad, because it lacks categories to adequately describe the fluid boundaries that exist between distinct traditions in this eternal Dharma. “Indra’s Net strongly opposes the work of a prominent group of scholars in the academy and beyond who claim that contemporary Hinduism, as we know it, is artificial and Western-generated and that it was constructed and perpetrated by Swami Vivekananda for political motives. Chapters 1 through 7 explain the details of this subversive thesis (called the ‘neo-Hinduism’ thesis), the backgrounds of its main proponents, and the history of how it came about. Paul Hacker, Malhotra explains, was the first academic scholar to develop the thesis of ‘neo-Hinduism’ charging that ‘neo-Hindus’ had disingenuously adopted Western ideas and expressed them using Sanskrit. He saw Advaita Vedanta as a world-negating and impractical worldview but contended that Vivekananda saw this flaw in Vedanta and intentionally re-engineered Advaita Vedanta to make it look world-affirming and hence attractive to Westerners. Malhotra is quite justified in calling Hacker the father of the subversive thesis of ‘neo-Hinduism.’ Indeed, it was Hacker who first proposed that the practical attitude toward non-Christian religions should consist mainly in what the Church Fathers called chresis, meaning theological utilization. Utilization connotes: (1) that the assimilated elements are made subservient to an end different from the context from which they were taken, (2) that they can be taken over because some truth is contained or hidden in them, (3) that they must be reoriented in order that the truth shines forth unimpeded (see Mehta, J.L. 1985. The Will to Interpret and India’s Dreaming Spirit. In India and the West: The Problem of Understanding, 179-201, Chico, CA: Scholars Press). Hacker used Indology as a field of specialized research (Wissenschaft) for investigating alien Indian texts for any useful material they might contain. An Indic text, Hacker claimed, does not answer us like a partner in a conversation because irrespective of what question the interpreter approaches it with, it always says the same; making the encounter a ‘static’ affair. Dynamism is introduced into it, he told Raimundo Panikkar, only when the interpreter takes up a stand vis-a-vis the text, outside its heathen context, exposes its ‘demonic’ ambiguity and barrenness in that soil and then, by an act of chresis, transplants any grains of logos-seed he may pick up there into the [Christian] soil where alone they can blossom and bear fruit—in the garden of the Church (Mehta 1985: 183-184). 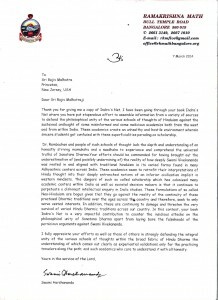 For this reason, Malhotra’s very original contribution lies in demonstrating how many of the precious ideas and concepts have been systematically removed from Hinduism (using the concept of chresis) and securely lodged in Western garb leaving the original Hindu sources to atrophy or making them appear obsolete. He has coined the term “digestion” for this syndrome. Chapter 12 and the Conclusion of IN articulate this syndrome with pertinent examples and discuss the existential danger this poses to Hinduism. The internet now offers potential for the dissemination of the ageless wisdom as recorded in Hindu philosophical teachings in an unbiased and creative way that will appeal to the moderns spread across the globe. Malhotra explains with great acumen how the Vedic metaphor of Indra’s Net first traveled into the very heart of Buddhist philosophy and then on to the West.